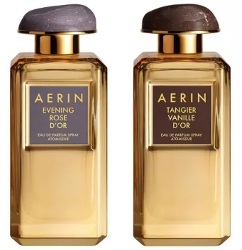 Aerin has launched Evening Rose d'Or and Tangier Vanille d'Or. The new fragrances for women are flankers to 2013's Evening Rose and 2016's Tangier Vanille d'Or respectively, and join Rose de Grasse d'Or and Amber Musk d'Or. Evening Rose d'Or ~ "Evening Rose turns to gold. The allure of night in the city deepens with notes of vibrant Juicy Blackberry, Lychee and Pink Pepper. At the intense heart, Rose Centifolia and Bulgarian Rose Absolute blend with the modern sensuality and magnetism of Miel de Provence Absolute. An intriguing aura of Incense, Patchouli, Amber and Creamy Leather lingers, shimmering like gold in the air." Tangier Vanille d'Or ~ "Tangier Vanille turns to gold, taking you more deeply into the mystery and splendor of Morocco. The heart of Madagascar Vanilla glides through crisp sun-drenched Italian Bergamot, Black Plum and rich Bulgarian Rose, becoming even more hypnotic with notes of Saffron and Myrrh. The sultry trail of Cashmere Wood, Crystallized Amber, Tonka Bean and Sandalwood lingers, shimmering like gold in the air." Aerin Evening Rose d'Or and Tangier Vanille d'Or are $240 each for 100 ml Eau de Parfum, at Neiman Marcus.